Genetics is where geneticists turn people into gibbering wrecks in their attempts to find superpowers using the DNA modifier. Watch out, as antagonists are known to blow up the nearby cloning devices so their victims can't be revived, and nuclear strike teams are known to occasionally blow down the walls and gun down any unfortunate bystanders in this place. Genetics, also known as Medical Research, is where geneticists turn people into gibbering wrecks in their attempts to find superpowers using the DNA modifier. Watch out, though, as antagonists are known to blow up the nearby cloning devices so their victims can't be revived, and nuclear strike teams occasionally blow through this area to get to Medbay. The APC for this room is in the maintenance tunnel right of it. Not only does it control the Genetek consoles, but it also controls the Cloning equipment above, even though it's not Geneticist-restricted like the genetics consoles. Genetics, also known as Medical Research, is where geneticists turn people into gibbering wrecks in their attempts to find superpowers using the DNA modifier while pathology researchers accidentally recreate the Black Plague but with involuntary Shakespeare quoting and plasma farts. It is mercifully isolated from the the cloning lab right down the hall. Genetics Research, often just called Genetics, is where geneticists turn people into gibbering wrecks in their attempts to find superpowers using the DNA modifier and hopefully remember to clone the dead people in the room above them. 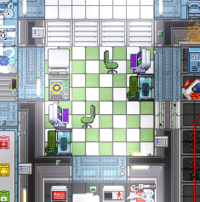 Speaking of which, despite the green tile border, the room above is open to all Medical, Security personnel, and Janitorial staff, not just Geneticists. The APC for this room is in the maintenance tunnel below it. Genetics is an huge but strangely sparse laboratory where geneticists attempt to find and research superpowers hidden in the human genome. This usually involves shoving unfortunate lab monkeys from the room above the morgue into the genetics scanner, magically turning them into humans, and looking through their genetic code via the GeneTek Constole for interesting/useful mutations. This process is extensively documented in the Guide to Genetics and part of the Geneticist page. At any point of this process, they may remember to check the cloning equipment below for people to scan and clone or ask for a crew member to come to Genetics so they can activate some choice mutations (which, rather unfortunately, tends to fall on deaf ears). The APC for this room is in the maintenance tunnel above it. Genetics is a great wide room in Medbay where geneticists attempt to create the next great generation of X-Men. This usually involves injecting multiple unfortunate monkeys with several hideous mutations, which is why there's an Monkey Pen and accompanying morgue area next to it. There is no vent. That is the true cost of creating superhumanity--no ventilation. The APC for this room is on the southernmost wall. 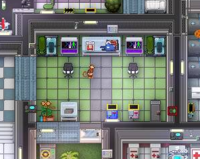 Genetics is a big green room between the Bar and Medbay where geneticists attempt to turn the station's inmates (and maybe a few of its monkeys) into the next stage of human evolution. The process evidently requires a whole more room than it does to turn them into cyborgs or grow food for them, plus a panoramic view of space, an ugly green double-helix in the floor, a lot of white jumpsuits and knit caps, a full box of tools,...basically, everything they need to never have to leave their lab. There is no vent. The next stage of human evolution will apparently not need air. The APC for this room is on the northern wall, near the table with the credit transfer device. 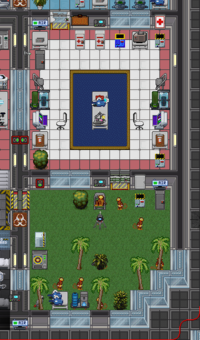 Genetics is a fairly small room in the western end of Medbay where geneticists make monkeys into men and make men into monkeys, usually attempting to somehow find super-powers along the way. 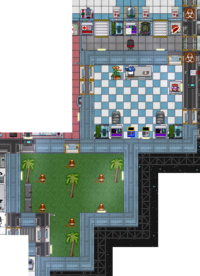 Being a monkey is usually considered improvement; being able to move under tables and through mail chutes makes this miserable rock of a station a whole lot less cramped, and not being able to talk to humans isn't so bad when they've all gone mad from isolation (plus, the extra speed and mobility helps evading the more violently psychotic ones). There is no vent. Better not monkey around with any bombs in there. The APC for this room is on the southernmost wall, near the disposal chute. 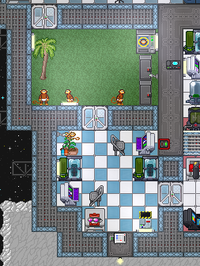 Genetics, and its accompanying Monkeydome, is a small laboratory near the top of Medbay's west corridor. Here, the station's Geneticists attempt to adapt the station population to underwater life, a process that usually either results in either an entire station of fire-breathing squids with superfarts or an entire lobby filled to knee-height with unused DNA Injectors and Activators. Neither outcome is particularly space-intensive. Most of the work is through just one computer. Hence, there's not much here besides two console-scanner sets, some mutadone for mutation removal, a basket of bedsheets and a locker with blindfolds and Electropacks for monkey discipline, and a first aid kits for discipline gone (horribly) wrong. There is no vent. GeneTek consoles don't need vents. 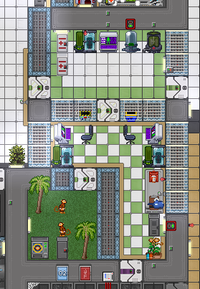 The APC for the Monkeydome is on the room's right wall, while the APC for the actual genetics lab is on its top wall. Just below/"downstairs" Medbay Hospital's cloning lab in green-and-white checkerboard is Medical Research, often just called Genetics in reference to the laboratory's research into the powers of DNA. Though this area is meant to be staffed by Medistan's surprisingly highly-paid team of Geneticists, anyone who can enter Medbay by their own accord is free to use the machines here. 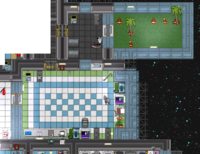 Speaking of which, thanks to great advances in miniaturization technology, all the research is done through just one computer and scanner, and this facility has two sets of them. Thanks to initiative to replace monkey pens with monkey dispensers, this room has a remarkably low footprint, especially in comparison to the microbiology lab. There is no vent. The initiative to replace monkey pens also advocated for the removal of vents, on account of reports of vents releasing bizarre alien gases that would suffocate monkeys. And humans. 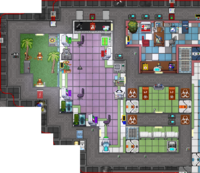 The APC for this room is in the bottom right corner. This page was last modified on 18 April 2019, at 04:58.